Finally, the solution to import your transactions in the IIF format. Convert QFX/OFX/QBO/QIF to IIF and import into Quickbooks. Review transactions in a readable view before converting. Support is available before and after purchase. Need to import transactions, but the format is not supported? Convert QFX/OFX/QBO/QIF to IIF and import into Quickbooks. Review transactions in a readable view before converting. Free trial (up to 10 transactions per file converted) is available. Support is available before and after purchase. Knowledge base with the solutions for similar conversions. Question and Answers page to ask questions and get help with developers and other users. Need to import transactions, but the format is not supported? 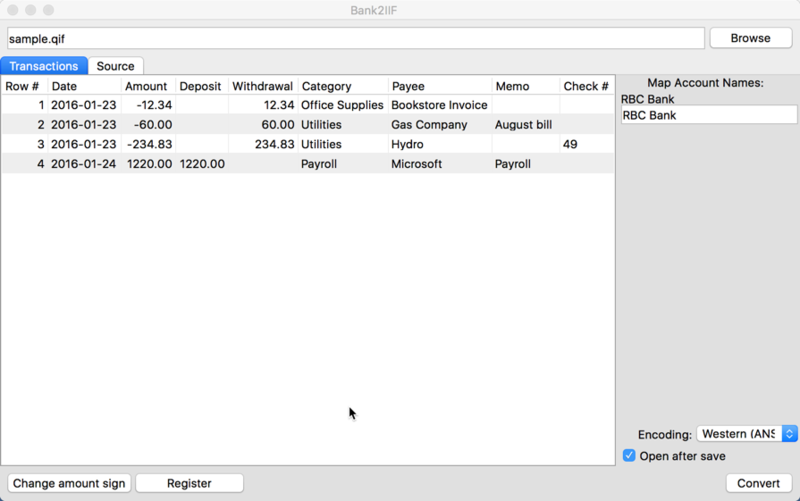 Convert QBO to QIF and import into Quicken, Quicken 2007 Mac, LessAccounting, YNAB, NetSuite, MYOB, AceMoney. Create importable QIF files for Quicken. Scan and save as PDF: Attach direct to Sage Customer Account. Simply place the documents in the scanner's sheet feeder, click on the scan button, enter an account number and other optional details.